Rereading the Fantastic Four comics from the start. 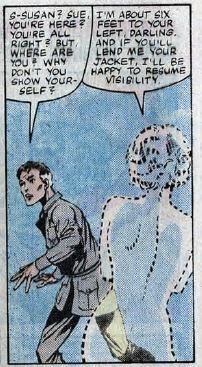 The first part of writer-artist John Byrne’s run on the book was a series of stand-alone Twilight Zone-style stories. Issue #241 is one of the last of those, before getting into bigger, longer arcs. We begin with Nicky Fury of S.H.I.E.L.D. visiting the FF, investigating strange energy readings in Africa. The energy is near Wakanda, home of the Black Panther, but coming from there. Because Wakanda is outside S.H.I.E.L.D.’s jurisdiction and because the Panther recently relinquished his Avengers membership, it falls onto the FF to investigate. Ben dresses up as treasure hunter Idaho Smith (get it?) for the trip. Frankie Raye joins them as well. Upon landing in Wakanda, there’s a brief fight with the Panther’s guards, after which Black Panther invites everyone to his throne room. He says he’s been tracking the same mysterious energy. He says the energy is coming from a nearby Tower of M’Kumbe, a place of dark legends. He outfits the FF with travel supplies and sends them on their way. Once they’re gone, Black Panther unmasks to reveal that he’s not the real Black Panther, but some guy named M’Naka. He’s filling in for Black Panther, who’s gone missing. Upon arriving at the tower, the FF are ambushed by men dressed as ancient Roman soldiers. They let themselves be taken captive to get more information, with Sue secretly following them while invisible. The soldiers lead our heroes into a deep underground complex, which leads back outside to a recreation of ancient Rome. 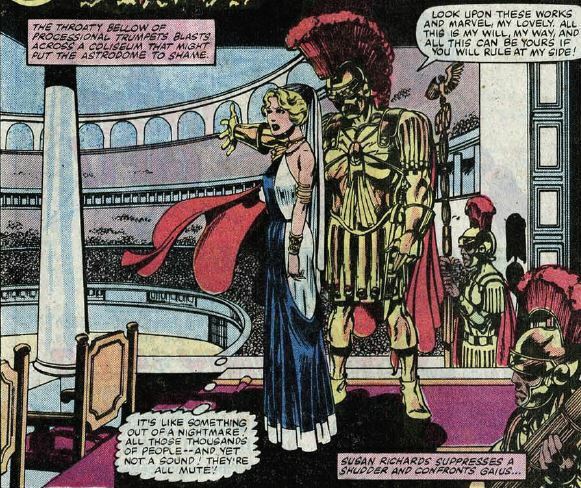 The FF are taken before the Emperor, named Gaius, whose face is hidden behind a golden helmet. Frankie has had enough, and attacks. Gaius then somehow neutralizes all the FF’s powers, turning Sue visible and transforming Ben back into a human. Gaius demands that Frankie be punished, Sue be kept as his new bride (! ), and the rest of the FF are to be imprisoned. Elsewhere, in a cell, T’Challa the Black Panther awakes surrounded by his unconscious hunting party. His fellow hunters are robots disguised as humans (why not?). He recovers his Black Panther costume from one of them and prepares his escape. Sue wakes up in a luxurious bedroom, where guards tell her that games are going to be held in her honor. In a cell, Reed thinks about how he’s encouraged his teammates to solve problems without their powers, and now finds himself having to do just that. 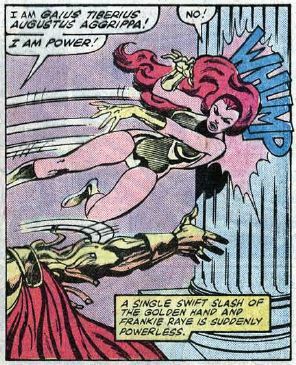 The Black Panther finds Frankie Raye hanging upside down over a fire, an ancient Roman means of torture. He then fights a couple guards. Sue, looking regal in a blue and white gown, is taken to a giant arena filled with people who make no sound. Gaius explains that he used his power to make all his citizens mute because they could not master Latin. Then we get the origin story. He was once a Roman soldier under Emperor Caligula, who came upon a crashed alien spaceship. He killed the alien inside and donned its armor, which unleashed the innermost power of his mind. Now immortal, Gaius set about recreating the glory of Rome in his own image. Gaius wants Sue to become his bride. He takes control of Johnny and Ben’s minds, forcing them to fight to the death in the arena. If Sue refuses, one of them will die. She fights back, pulling off Gaius’ helmet. There’s nothing underneath — it’s just an empty suit of armor. It collapses, and everything Gaius created is magically undone. All the people turn into age-old skeletons, and all the buildings crumble. 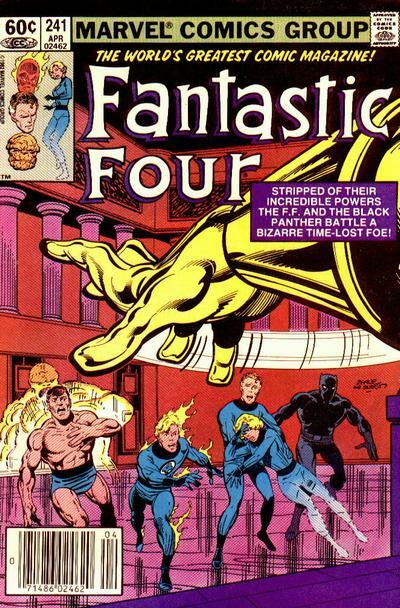 The FF get their powers back and escape, with Frankie flying the Black Panther to safety. The entire tower then disappears. After some cheeky business of finding some clothes for Sue, because her gown vanished along with everything Gaius created, Reed explains that the alien armor fed off of Gaius, so that his physical form was completely absorbed into the armor. With that done, the Black Panther leads everyone safely back to Wakanda. Unstable molecule: Despite his talk about using his brain to find an escape, Reed doesn’t actually do that. 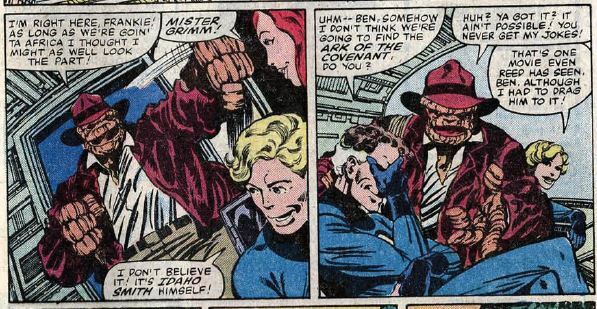 Nick Fury refers to Reed as “ol’ pal.” This is a subtle reminder that these guys are supposed to be World War II vets. 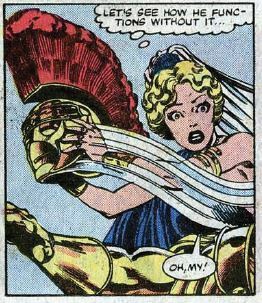 Fade out: These ‘80s comics went big with sexiness, and Sue is sexed up in this one, spending most of the issue half-naked. She does save the day in the end, though. Clobberin’ time: The Black Panther’s guards don’t recognize Ben because he’s in his original lumpy form instead of his rocklike form. He doesn’t look that different, guys. His temporarily reverting back to human isn’t made much a big deal of. Flame on: On the letters page, a reader chides the creators for Johnny’s use of the word “ain’t,” saying Johnny is too smart to talk that way. The editor (Jim Salicrup, I believe) argues that Johnny says “ain’t” only as a joke. Fantastic fifth wheel: Frankie has seemingly changed her opinion of superheroes now that she is one, saying that she’s always dreamed of meeting the Black Panther. 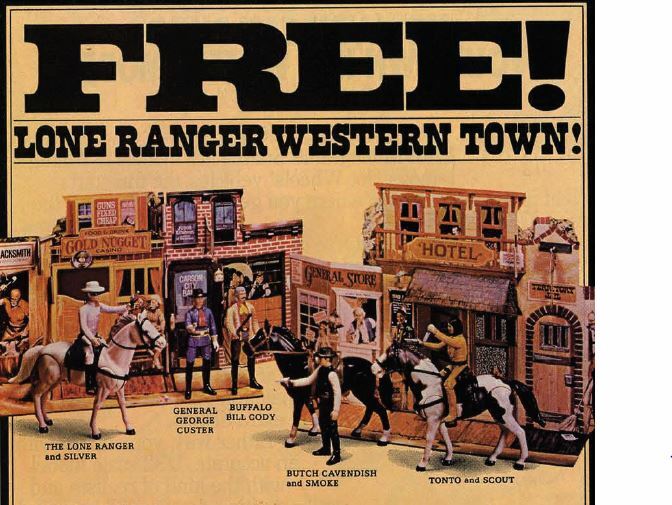 Commercial break: Thanks to this ad, I learned Cavendish’s horse’s name is “Smoke.” I have no idea what Custer and Buffalo Bill are doing there. Trivia time: We’re not told, exactly, how or when the Black Panther left the Avengers, but it would have to have happened sometime between his appearance in the book in issue #181 and when the new lineup was announced in issue #211. An ongoing thread throughout that entire run was about cutting the large Avengers membership down to just a core group, and the Panther didn’t make the cut. In Amazing Spider-Man #229, which came out the same month as this issue, Madam Web tries to contact the FF and ask them help Spider-Man battle the Juggernaut. She learned they were out of town and poor Spidey had to fight alone. Fantastic or frightful? Talk about packing a lot of info into a single issue. This is like reading an entire movie in 22 pages. Byrne has the whole thing divided up into chapters the way Lee and Kirby used to, for some retro run and to make the story feel bigger than it is. Just a good old fashioned adventure story. Next week: New York goes galactic.